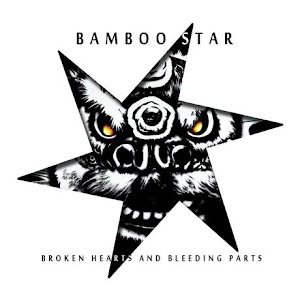 A thorough review of Bamboo Star’s latest EP, Broken Hearts and Bleeding Parts couldn’t be written without handling the physical release. No expense was spared on the HK group’s record, with lush artwork, a lyrics sheet that flips over to a poster, a band logo sticker, and a CD cut to the shape of a throwing star! It’s not just the packaging that’s polished though; all six tracks are executed precisely with pristine production. Opener Ready to Roll kicks off the axe-worship with gasoline-soaked chord progression and a whiff of Motley Crue’s hairspray histrionics. Older track Electric Love may show its age with clunky lyrics, but lead guitarist Terrence’s harmonic squeal Satriani fretwork has us dusting off the leopard-print air guitar and shredding hard. Breaking Limits is a cheesy, leather-trousered “RAWK” ode to ’80s hair metal and stadium leviathans X Japan, Airbourne and Thin Lizzy, with lead singer Wolf Red doing his best Scott Weiland impression alongside revving rhythms. If the slower, serious Believe in our Memory is BS’s Cemetery Gates, From Stagelights to Streetlamps is November Rain. As the album’s “stood in front of a giant fan clutching at the air” moment, the power ballad risks slipping into Steel Panther territory with dunderheaded lines like “I can smell the perfume from your lips in my mind.” An echoey, Slash solo melts like fondue over a thousand lighters held aloft. Don’t Turn Around – the heaviest track on the EP – opens with a clattering, jagged riff and progresses to stuttering metal breakdowns and a shrill solo that would have Dave Murray grimacing in appreciation. Squeezed into a constricted three-and-a-half minutes, the song could have comfortably been twice as long. Red’s skin-tingling banshee vocals bring the album to a close with a howled “baby don’t turn around”. With so many influences thrown into the pot, it’s hard to sound original. But BS bring the fun back into retro rock ‘n’ roll with an energy that’s amplified at their famed live sounds. You can find Broken Hearts… on iTunes, but this kitsch disc is truly a trophy to hang on the wall. Bamboo Star’s Broken Hearts and Bleeding Parts can be downloaded here on itunes. To get your hands on a physical copy, check out the stocklist here.